Sometimes you read just a few words that someone has written and know you’d enjoy a cup of tea on a rainy day with that person. That’s how I feel about Cassandra Dunn. I think you’ll find her gentle and charming, too. 1.Tell us about your book. 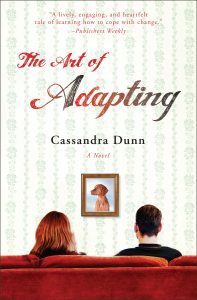 The Art of Adapting is the story of a family in transition. The novel is told from alternating points of view of Lana, recently separated, her two teenagers, Byron and Abby, and Lana’s brother Matt, who has Asperger’s Syndrome. Matt moves in with Lana to help cover the rent, both disrupting the family dynamic and offering a valuable new perspective to the mix. As each character deals with their own struggles, ranging from anorexia, new love, illness, to bullying, they find the balance of leaning on family while learning to stand alone. I was inspired by my uncle Mike, who had Asperger’s Syndrome, to write a novel centered around a character with Asperger’s. I wanted to portray not just the challenges of living with and loving someone with Asperger’s but also the valuable insights and unique perspective offered by people with Asperger’s Syndrome. No matter what I set out to write about, my work tends to end up centering around relationships: the messiness of human connection, of misinterpretations and biases, and how we get in our own way as we struggle to grow. I’ll read across any genre, as long as I feel the writing is good, the characters are fully developed, and the plot is captivating. When I’m not writing you’ll find me spending time with my daughters, hiking with my dog, doing yoga, or catching up with friends. If I have to step back from a writing project because my agent or editor has the current copy of my manuscript and I’m on hold until I receive feedback, I use the downtime to catch up on reading or critiques for writing partners, but I try not to get away from daily writing for long. Even if I’m just jotting down ideas or random scenes that might be used in a future project, I like to keep up the momentum. I find that if I get away from my writing schedule for any significant length of time, it’s a challenge to get back into the rhythm of daily writing. 4. What made you believe you could write a book? How did you dispel doubt as you wrote? Honestly, the doubt is still there. Even after writing a novel and having it published, there’s a part of me that worries it isn’t real, or that I’m not worthy. So I think rather than dispelling doubt, I’ve just learned to live with it, while not letting it consume me. When doubt flares up I acknowledge it for what it is: fear of all the what-ifs (will anyone buy this story?) that are so far down the line in the writing/publishing process that they are irrelevant in the drafting stage, and then I put my head down and get back to work. I started out writing short stories, and once I’d gotten some of those published, I took one and lengthened it into a (terrible) novel, just to try out the form. It was a huge challenge, and I made a lot of rookie mistakes, but I learned a lot, and I knew that I wanted to keep going, keep trying, keep improving. I still feel like that. It’s a process, and everything I write is a chance to learn more about myself as a writer. Maybe in that way the doubt is good: it keeps me hungry, keeps me humble, and keeps me open. 5. Describe the first 2-3 steps of your process in writing your book. My first step of writing The Art of Adapting was figuring out the characters. I wrote a lot of backstory on Lana and Matt that never made it into the book but that I needed to get a clear grasp on where they’d come from, everything from childhood memories to recent events, interactions with people who never ended up being part of the novel. It was trial by fire, and I had to burn a lot of pages as I found the right starting place for each of the characters. Then I started with a few scenes, rooting the characters in the present world I’d come up with, having them interact with one another, figuring out what they did for a living, who Abby and Byron’s best friends were. At that point I started an outline, to give the story shape, and to have an arc to follow. But the thing with outlines is, as soon as I finish one, I tend to veer off-course and head in a different direction. It’s like outlines give me the confidence to move forward more than fully mapping out where I’m headed. 6. Which is more difficult – drafting or revising? Why? For me, drafting is the fun part. Just getting it all down on paper, letting the characters lead the way, getting to know my own storyline as I progress, turning off my internal editor and letting the words come without a filter. Revising is where the work comes in. Cutting those hard-earned words to make room for even better material is a struggle on multiple levels. Revising one chunk of the story carries a ripple effect, requiring a full read-through to catch everything that referred to the old story-line. It’s a strange mix of new creation and excavation of what’s already there. I find that to be both the most difficult and the most rewarding phase. 7. What is your favorite part about being a writer? The work itself is my absolute favorite thing about being a writer. There is nothing better than being able to earn a living doing what you love. It’s the only job I’ve ever had where I wake up excited to get to work no matter where I am in the process. But a close second is the community of writers that I am surrounded by. So many inspiring, talented, encouraging people have come into my life through writing. I can’t imagine my life without them. 8. What is your least favorite part about being a writer? Promotion. I’m a quiet person. I’m not one to speak up in a crowd, and I am much more interested in hearing other people’s stories than talking about myself, so the pressure to put myself out there, both through social media and at events, is way outside my comfort zone. 9. How did you learn to write? I learned to write from great teachers: from my 4th grade student teacher who assigned me a short story that ignited my passion for writing, to junior high and high school English teachers who recognized some talent in a very shy girl and pushed her to read her work aloud to the class, in a very shaky voice, to prove to me that I was able to connect with readers better than I thought, to phenomenal professors in college and grad school, I have so much gratitude for all of the teachers in my life who believed in me long before I believed in myself. 10. What are some things that get in the way of your writing? How do you move them out of the way? Self-doubt gets in the way of writing. I think I always had this idea that once I had a book published by a Big Five publisher, I’d find this untapped reservoir of confidence and I’d never find myself staring at a blinking cursor or a blank page doubting myself again. But the self-doubt never went away. I still have bouts of imposter syndrome, wondering if I’m fooling anyone that I know what I’m doing. In those moments there’s only one solution: stop thinking about what others will see in me, and write because I love it. As long as I’m writing for myself, out of my own drive and passion, the doubt can’t touch me. It’s only when I start to worry about editors and reviewers and critics that I feel unsure. I know that if I’d never gotten a book deal I’d still be writing every chance I got. Remembering that love of words, that passion for creating characters and crafting stories that set me on this path is vital to continuing on it. The doubt will always be there. I find the best method for dealing with it is to simply nod and wave as I pass it by, and keep going on my writing journey. Cassandra Dunn is the author of The Art of Adapting (Touchstone/Simon & Schuster). 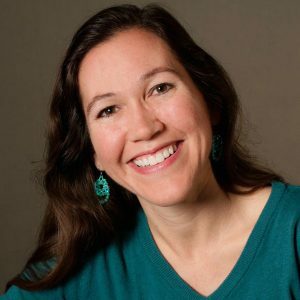 She has an MFA from Mills College and lives in the San Francisco Bay Area with her two daughters and her Vizsla Toby. She can be found at www.cassandradunn.com, on Facebook, and on Twitter.